UMP | University of Minnesota Press Blog: How do libraries keep up with their communities as their work changes with the times? How do libraries keep up with their communities as their work changes with the times? 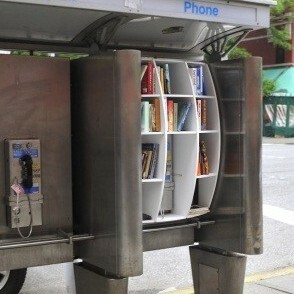 Heard of Phone Booth Libraries? They've been popping up around NYC thanks to the work of architect John Locke. Across the world, libraries struggling with dwindling budgets are finding creative ways to engage their communities. Image source. It was only a decade ago that America’s public libraries were still enjoying their “third wave” of major construction (the first boom was during the Carnegie era, and the second, at mid-century). High-profile architects were designing innovative library buildings for downtowns that were undergoing dramatic renewals. Throughout the 90s and early aughts, many libraries regarded their construction projects as opportunities to work through critical questions regarding their institution’s functions and identity: What role did these buildings play in their cities? What were their obligations to their multiple publics, and how could the building provide space to serve those publics’ needs, while also honoring the library’s obligations to its collections and infrastructure? How would libraries balance their provisions for both “old” media and “new”? How would they create buildings that are flexible, functional, and full of light – and that reflect their cities’ evolving identities? How’s a library to keep up? Some have responded by building hackerspaces and fablabs for the public – or, like the NYPL, creating in-house labs for technological development – transforming the library into a space of technological praxis, a place where learning is transformed into making. Others have continued along a path set by early library innovators, many of which I profiled in my book, and incorporated more public gathering, multi-use, and even commercial spaces into their library buildings. Still others have developed robust social media identities and optimized their web resources for mobile phone users, and some have incorporated innovative gaming ventures (the challenge here is to avoid simply jumping on the “gamification” bandwagon). With each new Google product release, new mobile technology development, new e-reader launch brings new opportunities for the library to “innovate” in response. And while “keeping current” is a crucial goal, it’s important to place that “pursuit of currency” in a larger cultural, political-economic, and institutional context. Striving to stay technologically relevant can, in fact, backfire when it means merely responding to (or, if you’re Harvard, keeping ahead of) commercial media’s profit-driven innovations; we see these mistakes – technological innovation for technological innovation’s sake – in the education arena quite often. It’s important that libraries keep sight of their long-term goals and time-honored values, which should remain steadfast regardless what Google decides to do tomorrow, and that they keep in close contact with their publics. In my book, I focused a great deal on how libraries involve and respond to their publics, and how they balance seemingly competing obligations: to “old” and “new” (and ever-“newer”) media, to public service and commerce, to staff and patrons. Other critics and scholars have paid attention to how libraries have long negotiated the tricky terrain between copyright (and, increasingly digital media rights management) and freedom of access, between preservation and innovation, etc. Those challenges won’t go away. They may manifest themselves in different forms week by week, but the basic provocations should be familiar. Libraries will be better positioned to face those challenges if they do so with their publics at their side – and that partnership requires the cultivation of a robust system of exchange and collaboration between libraries and the communities from which they emerge, and which they serve. Shannon Mattern is assistant professor of media studies at The New School. She is author of The New Downtown Library: Designing with Communities. "I've kept Shannon Mattern's superb book, The New Downtown Library, beside me for several years as an invaluable guide to all the wonders and travails associated with the great project of public library-building. It doesn't pull punches, it is erudite and filled with fine insights, and the writing is energetic and at times profound." Our need for consolation: reading Stig Dagerman. They Came for John Fea.